5 stars - "Epson Stylus Photo PX660 All-in-one InkJet Printer with CISS" by Emma, Written on 2012, 17:38/04/25 I print lots of photos. Thanks to my px660 I've got good bright ones. 5 stars - "Epson Stylus Photo PX660 All-in-one InkJet Printer with CISS" by Michael, Written on 2012, 21:34/04/30 Thank you a lot. Print excellent. 5 stars - "Epson Stylus Photo PX660 All-in-one InkJet Printer with CISS" by John	, Written on 2012, 11:52/07/06 Prints good.But don't need scanner, not use it. Buy Printer Epson Stylus Photo PX660 with CISS and make 30 times more quality prints	for the same money! Simple and compact Stylus Photo PX660 Epson is a photo center that prints images with better quality than standard photo labs do. It allows adjusting images independently without using any complicated programs. You can simply select the photos you want with the help of the LCD-monitor, quickly and easily edit them, add desired effects if you wish and print. Epson printer-scanner prints documents, color and black-and-white photography very quickly (10x15 pictures - just in 12 seconds). 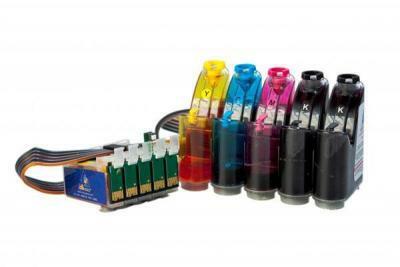 In addition to high speed continuous ink supply system ensures you low cost per print. Moreover, special ink, with which CISS is filled, will keep bright colors of your photos up to 200 years. It is easy and convenient to operate and the scanner of this series. With it, one can quickly scan documents and photos just at home. Touchpad control panel (TouchPad) guarantees maximum comfort while using. 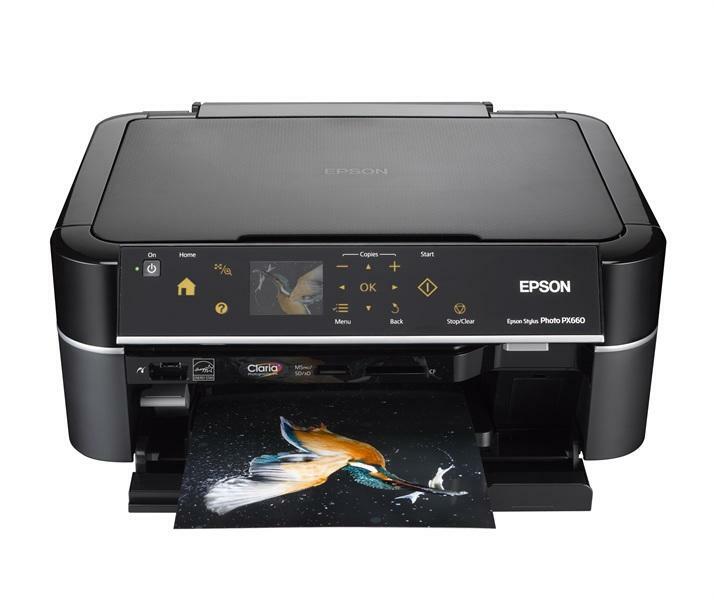 Printer, copier and scanner of the Epson Stylus photo PX660 printer model allow you with comfortable and quick work and also let you enjoy photos for decades. Alternative models Stylus Photo p50 and Epson Stylus photo PX730WD will be ideal MFP for home too. The proposed model is worth buying just for its compact size. In addition, this model has a stylish and modern design. In the middle of the black body there is a plastic gray line. Above the line inscription the Epson PX660 is glossy and matte below it. Of course, on the glossy side fingerprints and dust is very noticeable. Touchpad is black, with a beautiful orange backlight. Looks stylish and easy to use. The display has a diagonal of 6.3 cm. Below the control panel there is a USB-connector for cameras and external storage devices, card readers and special stickers, certifying compliance with the international standards of energy saving and the use of proprietary dye-based EpsonClaria inks. This device has a horizontal tray for ready prints and a vertical for plain paper. This is a very convenient solution. There is also a special pull-out tray designed for CDs. Epson Stylus Photo PX660 printer allows getting great quality of printing and colors. MicroPiezo print head lets to receive the minimal ink droplets' size of 1.5 pl. It uses 540 nozzles (90 nozzles for each of the 6 colors) for work. This model has a high printing speed: 37 pages of text or 38 with pictures in just 60 seconds. And a standard photo of 10x15 cm will be printed in no longer than 12 seconds. Being an inkjet printer created for home use, this machine offers simply phenomenal performance. Scanner with the resolution of 1200x2400 dpi, provides the highest quality scanning and copying. Xerox does not necessarily need connection to a computer. Inkjet printers and MFPs from Epson provide first-class photo printing and work very quietly. Easy printing mode is no exception - it distinguishes this model from the previous ones, which has worked much more noisily while being tested. Scan quality of Epson Printer Stylus Photo PX660 is consistent with manufacturer's promises. Epson Stylus Photo PX660 all-in-one printer is a very convenient device for home printing. I print lots of photos. Thanks to my px660 I've got good bright ones. Thank you a lot. Print excellent. Prints good.But don't need scanner, not use it.